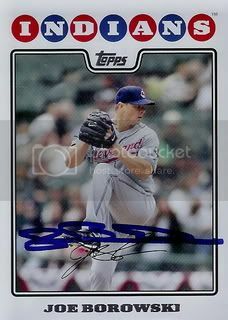 A few months ago, Joe Borowski signed his base card from the 2008 Topps set for us. 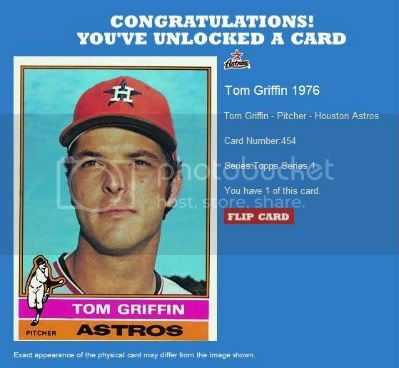 Just this past week we got back his card from the Cleveland Indians 14 card team set. 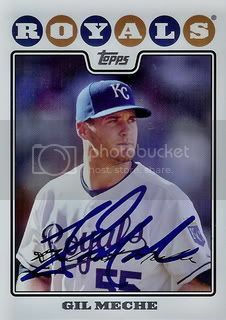 This one is cool because the picture is slightly different than his regular issued card. 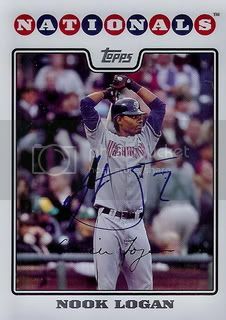 Former Washington Nationals outfielder, Nook Logan signed a card for our set. Nook's last appearance in the big leagues was back in 2007. 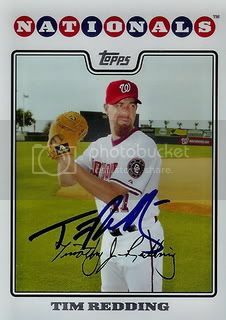 We added a signed card of current Washington Nationals star, Jayson Werth to our set. I remember seeing Jayson play in the Arizona Fall League several years ago when he was a prospect in the Baltimore Orioles organization. This one came from a friend on SportsGraphing.com. 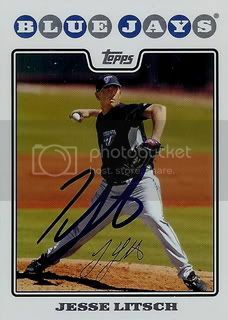 Former Rookie of the Year, Jason Jennings has the distinction of being the first player to sign a card for our set TTM. Back on March 3, 2009 we got his U&H card signed. You can relive that historic moment by clicking here. Over two years have passed since that day. 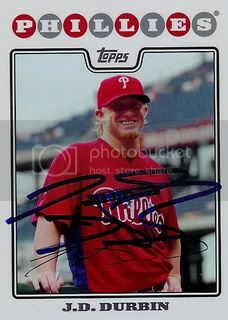 In that time we've accumulated over 420 signed 2008 Topps cards. Thanks, Jason for helping getting this all started and for now signing your card from Series 2 for us. 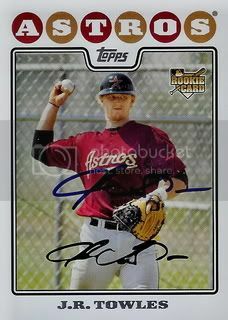 Former Houston Astros prospect, J.R. Towles signed a card for our set. J.R. is back on the big league roster after Jason Castro's season ending injury. 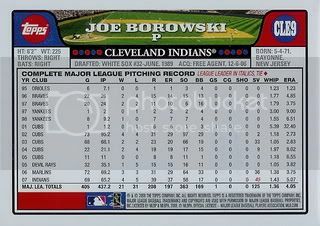 I actually got this card from a friend on SportsGraphing.com last summer. This was well before Brian Wilson turned into the legend and superstar he is today. It was before the beard, before the commercials, and before the World Series ring. I guess that's why the guy let it go for only a few bucks. Obviously we're glad to have this one for our set. 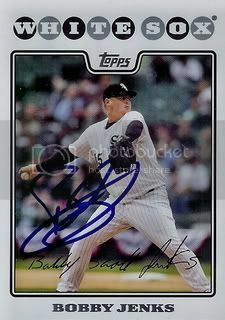 We picked up this signed 08 Topps card of former White Sox closer and two-time All-Star, Bobby Jenks. Pretty cool. This 2008 Topps jersey card has been in our collection longer than most. 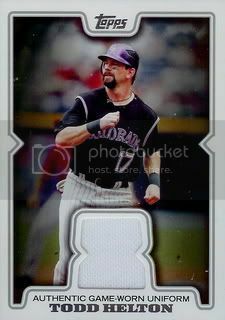 I got this Todd Helton card out of a Series 2 blaster I bought during the summer of 08 just before my son was born. This was well before I had the idea of collecting 2008 Topps cards. 1998 American League All-Star, Damion Easley signed a card for our set. Damion is one of the "D-Backs Legends" who will be signing autographs at this year's All-Star Fan Fest. If you'd like to see the full list of who's participating, click here. 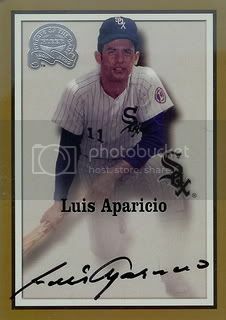 Unfortunatley it looks like Luis Aparicio will only be at Fan Fest on Sunday and Monday. We didn't buy tickets for those two days since we'll be busy with the Future's Game and Home Run Derby. Maybe we'll get lucky and they'll change the schedule. 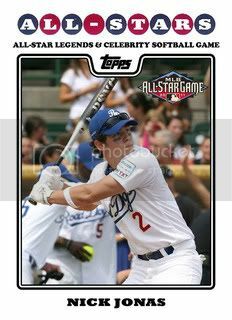 Earlier this week MLB.com started announcing who will be participating in the 2011 Taco Bell All-Star Legends & Celebrity Softball Game. I decided to make a few custom cards for some of the participants. Our final card is of softball legend, Jennie Finch. Right now, you're probably thinking... "Hey! It's Jordin Sparks. Didn't she win American Idol?" You're so smart. You may remember Amaury Nolasco from the television show, Prison Break or the cinematic classic, 2 Fast 2 Furious. Next up is music legend, Nick Jonas from the Jonas Brothers. Most of the cards I made were for the celebrities but here's one of baseball legend and Hall of Famer, Goose Gossage. 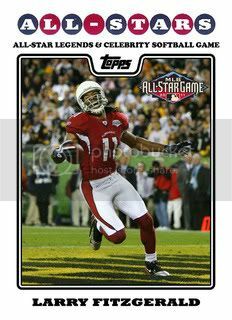 First up is Arizona Cardinals wide receiver, Larry Fitzgerald. Here's another nice addition to our set. 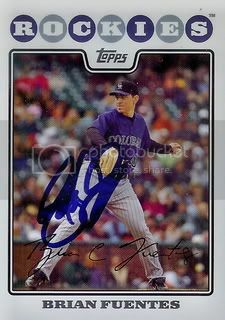 Thanks to a friend on SportsGraphing.com we now have a signed 2008 Topps card from 2007 American League All-Star, Gil Meche. 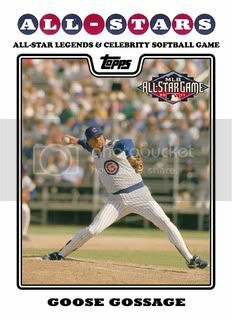 Fleer's Greats of the Game sets were amazing. They featured a great design, a great checklist, and great autographs. This Lil Luis card is one of the nicest ones in our collection. Veteran right hander, Tim Redding signed a card for our set. 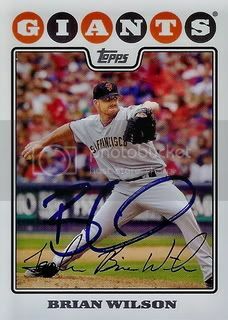 After spending time with the Astros, Padres, Yankees, Nationals, and Mets Tim is now with the Los Angeles Dodgers. He is currently assigned to their Triple A team, the Albuquerque Isotopes. 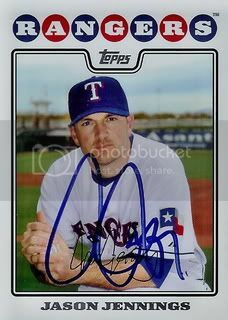 Former Texas Rangers prospect, Wes Littleton signed a card for our set. 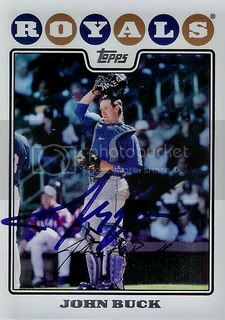 Wes last played in the Major Leagues in 2008 with Texas. He is now with the Seattle Mariners organization. 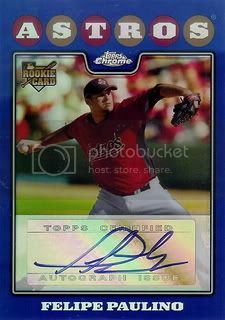 I bought a few packs of 2011 Topps Series Two this week and got two codes. 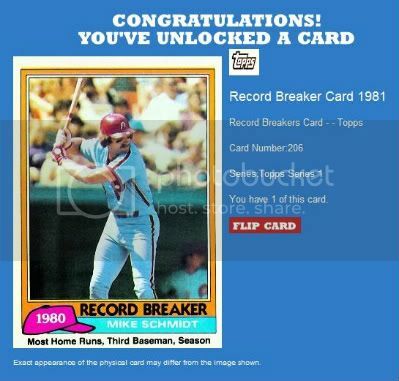 Sadly, the 1981 Mike Schmidt Record Breakers card is probably the best one I've ever gotten from one of these. Sorry, Tom Griffin but it's true. J.D. 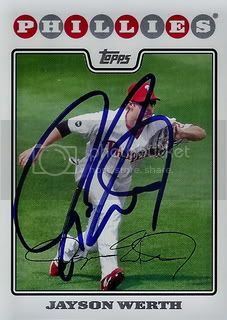 Durbin last played in the Major Leagues in 2007 with the Philadelphia Phillies. According to his Wikipedia page, he recently signed a contract to play professionally in Mexico. We picked up this signed card of J.D. from a friend on SportsGraphing.com. Added another All-Star to our set. This one is of former Royals backstop and 2010 All-Star, John Buck. 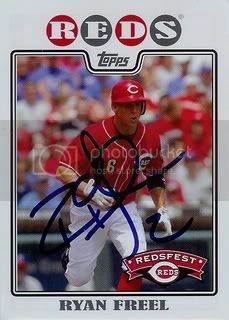 A friend from SportsGraphing.com saw our blog posts on the other Redsfest cards in our collection and sent along this signed card of Ryan Freel. Got a good one back in the mail. 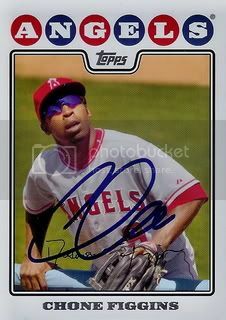 Former Angels infielder and current Seattle Mariner, Chone Figgins signed a card for our set. This was our second try writing to Chone. Glad to get this one back. Good news! We got our first four blue refractors from the 2008 Topps Chrome set. These are really cool and numbered to only 200. 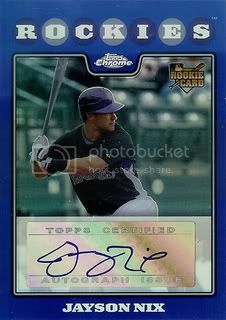 The final one is of Colorado Rockies infielder, Jayson Nix. 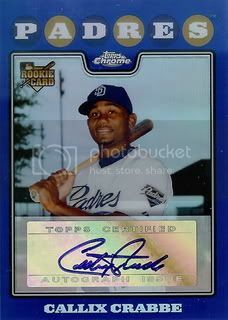 The third is of San Diego Padres infielder, Callix Crabbe. 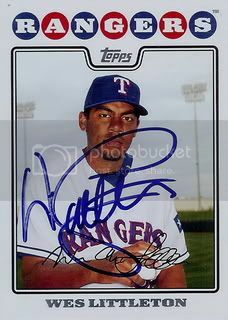 The second is of Houston Astros reliver, Felipe Paulino. The first is of Chicago Cubs pitcher, Kevin Hart. 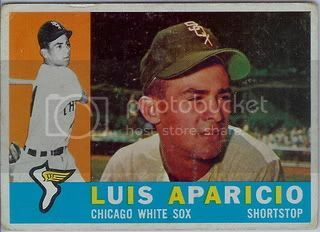 Since I decided to start a Luis Aparicio player collection, I've been looking on eBay for good deals on his vintage cards. Picked up this 1960 Topps for less than $2 shipped recently. Great card. The centering and color are great which makes up for the rough corners. We added another good one for our set. My dad won this card off eBay for us. 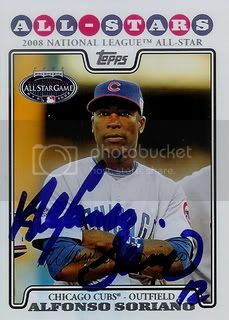 It's Alfonso Soriano's All-Star card from the 2008 Topps set. Thanks, Dad. Soriano is a 7x All-Star and was even the All-Star Game MVP in 2004. 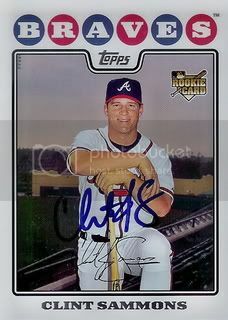 Former Atlanta Braves prospect, Clint Sammons signed a card for our set. He is currently with the Marlins Triple A club, the New Orleans Zepheyrs. Our friend Raiderdan from SweetSpotGraphs.com came through for us again with two more signed 08 Topps cards. 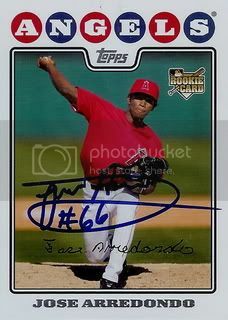 The second is of former Angels reliever, Jose Arrendondo. Jose is now with the Cincinnatti Reds organization. Another great card. Thanks, Dan! The first is of Toronto Blue Jays starting pitcher, Jesse Litsch. I've been doing pretty good this year at trying to do a blog post everyday. 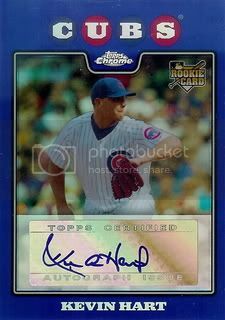 I missed the past three days but we're back with another signed 08 Topps card. Check back often because we've got a lot of good stuff lined up for June. We added this signed Brian Fuentes card to our set. Brian was recently released from his closing duties with the Oakland A's. When the news hit a few days ago, it sounded like Brian might not be welcome in Oakland for very long. I wonder if he'll end up getting traded soon.